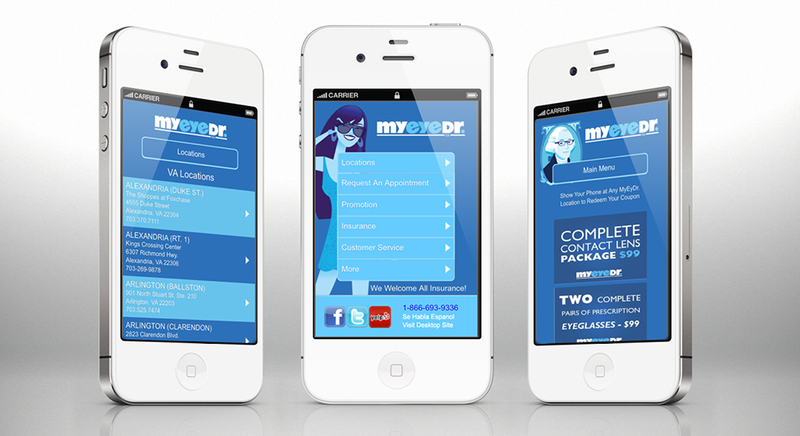 As a result of launching a new website and brand identity, MyEyeDr. engaged Delucchi Plus to take their social media program to the next level, creating a more identifiable voice and presence in the social space to help debut the new brand. While our new social strategy was successful, MyEyeDr.’s new website was not: After experiencing a significant reduction in traffic to the website after relaunch, MyEyeDr. engaged our team to design a complementary mobile site, identify the new site’s problems, and optimize it for search. Our mission: Diagnose and correct the technical site elements, drive traffic to the new site, grow appointments booked online, and organically build site authority in conjunction with a paid search campaign. Our SEO keyword strategy varied by type of page within the site, introducing location-specific pages on which we optimized for eye doctor and optometrist terms as well as location terms. To increase authority of our location pages, we also claimed business listings in Google for all MyEyeDr. locations and submitted each location to the top online business directories as well as geo-coded each individual location page and marked up the address with data highlighter. On non-location pages, we matched a limited number of keywords to the content on each page to increase rankings for specific terms, including optimized title tags, meta description, image file names and alt tags, H tags and page copy. Keeping XML sitemaps and Robots.txt files up to date ensured that Google could easily crawl and index these pages. We took a nuanced approach with the paid search strategy, using varying tactics in different campaign stages. In emerging markets such as North Carolina and Georgia, where we had a higher cost-per-click due to the infancy of our campaign and lack of brand equity in the market, we bid for the bottom of the premium position on brand and non-branded terms, including terms such as “optometrist” and “eye care” that had historically higher conversation rates as opposed to product terms. Bidding on variations of the “MyEyeDr.” name was still important in these markets in order to push brand awareness and brand name equity while taking advantage of low costs. With the new market strategy, we also began bidding on former practice names. In more mature markets, we focused on acquisition of new customers through non-branded terms and premium placements of ads due to lower costs-per-click. In all markets, paid search efforts were geo-targeted to specific geographic areas and in six markets we translated paid search efforts into Spanish both via display campaign and using the same keyword and geo-targeting strategy. On Facebook, we ran promoted post and website click ad campaigns simultaneously, always geo-segmenting our efforts to deliver targeted messaging and gauge performance per market. 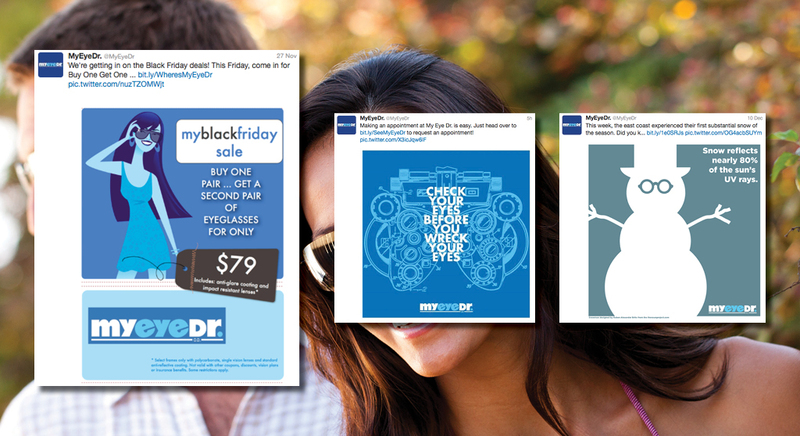 While we used promoted posts to achieve expanded reach and engagement with content targeting existing fans and their Facebook friends, our ad campaigns promoted a specific offer — such as a $29 eye exam — that drove traffic to the MyEyeDr. 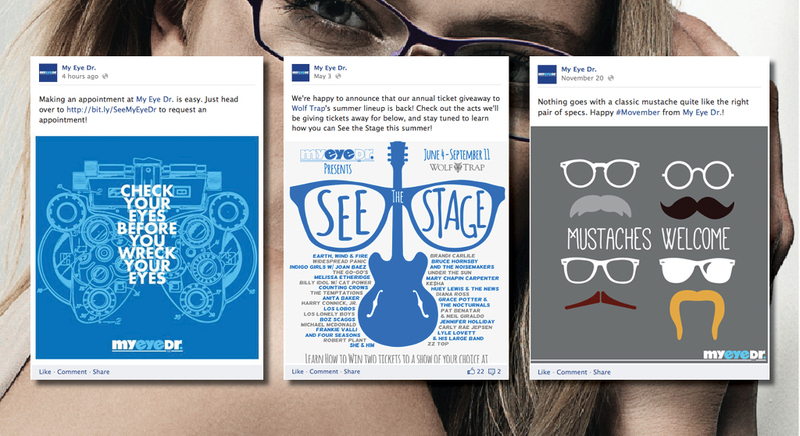 website and targeted users not yet fans of the MyEyeDr. Facebook page. Based on the success of our digital programs, Delucchi Plus was selected as MyEyeDr.’s agency of record in 2014, an engagement that included marketing research and strategy development to complement our digital efforts and ultimately grow MyEyeDr. from a boutique local chain to aregionally recognized brand. Our team managed all media buys and creative production across traditional print, outdoor media and even radio throughout a year marked by significant geographical expansion for the brand, with creative concepts designed to introduce MyEyeDr. in new markets and convert patients already loyal to small family practices to patrons of the new, rapidly expanding brand. As a result of our keyword strategy – which emphasized location and keywords — between 2012 and 2013 traffic increased by 17% and conversions through organic traffic increased by 31% from with a total of 10,887 online conversions. In 2014, the SEO traffic contributed 14,201 online conversions constituting a 764% increase in traffic YOY and a 31% increase in conversions. Between 2012 and 2013, PPC conversions increased by 71.2%, In 2014, we drove a total of 11,759 conversions, including both online form submissions and phone calls tracked back to our PPC efforts. These conversions produced $4,197, 963 in revenue, or a $16.6 return on investment. At the same time, we were able to reduce the cost per acquisition by 31.6% between 2012 and 2013 and by 38% between 2013 and 2014, overall producing a 118% return on investment that year. On the social front, we increased Facebook likes by 84% in 2013 and by 264% in 2014 for a total of almost 13,000 new page likes.